The key to getting great results when photographing houses is understanding how perspective affects your final picture. 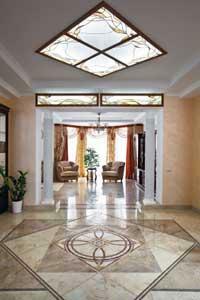 A stunning image of a home depends on reliable equipment and knowing how to use it. A single lens reflex camera with changeable lenses is the best equipment for tackling a house photography project. This will allow you extra versatility when shooting tricky shots. Choose a camera body which excels in both regular and low light situations, so that you can photograph the home's interior and exterior. Wide angle lenses help to open up rooms, making them appear larger. They also allow you to take sweeping images of a large house and property. These lenses can be stationary or variable in length. Variable focal length lenses, known as zoom lenses, have the advantage of being flexible, but can create distortion based on their shape and optical elements. If you are going to be photographing houses often, choose a high-quality fixed focal length lens with a wide angle. Many cameras have built-in flashes, but these can be inadequate when faced with documenting the interior of a home. A detachable, hot shoe mounted flash unit with a head that swivels is the ideal tool for bouncing light into dark corners of a house without casting distracting shadows. This is another essential element for a good photograph, especially when using a camera in low light situations or for shots of a house's exterior. A tripod will help you keep the camera steady at low shutter speeds. It's important to remember a few simple tricks when photographing a home. This shot is arguably one of the most important in photographing a home. It is often the first image a prospective buyer sees when looking at potential homes. Plan your shoot for a time of day when traffic is quiet. You should also aim to shoot the home on a day with nice weather to portray the house in its best light. Cloudy weather works well, since the clouds diffuse the light naturally and minimize large, distracting shadows which may be cast by the architecture and obscure details. You will also want to choose a time when the sun is not directly behind the house, as this will cause backlighting to ruin the image. If you cannot avoid a backlit exterior, increase the exposure on your camera one or two stops to compensate. Avoid exterior shots or angles with clutter or distractions, such as cars or people. These detract from the image of the house and lessen the impact of the home as the focal point of your image. Use a tripod when photographing a home's exterior and crop the shot in-camera to avoid future editing, which may cause the image to be too small to use. Distinctive property features such as ponds, barns and pools can always be photographed separately. Concentrate on presenting the house first. A lens focal length setting of anywhere between 40-50mm gives a nice compromise between convergence and distortion in the final image. Use natural light as much as possible when photographing the interior of a house. Turn off interior lights if possible since these can add an unwelcome color cast to your finished image. If you must use the home's interior lights, make sure the color balance settings on your camera are set to compensate for the color cast.Next, set your camera to a high aperture setting so that a wide focal plane keeps the image in focus. You may need to compensate by using a slower shutter speed; this is where a tripod comes in handy. Select a high film speed or ISO setting on your camera to make the best use of the available light. If this is not enough, it is time to break out the flash. Bounce flash off of an adjacent wall or the ceiling in order to avoid casting harsh shadows in the room. Select a wide angle lens at the widest setting to make rooms appear open and airy even in small spaces. Also, use your tripod to ensure the camera is not being tilted up or down, since even the slightest changes in angle can lead to distortion as lines converge.